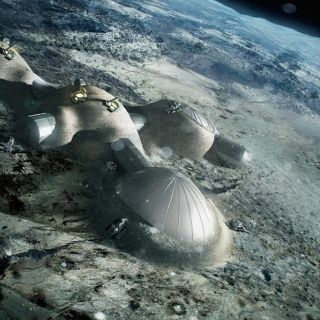 The European Space Agency has been looking at what it takes to construct a moon outpost. COLORADO SPRINGS, Colorado — The incoming leader of the European Space Agency is keen on establishing an international base on the moon as a next-step outpost beyond the International Space Station (ISS). The next European Space Agency director general, Johann-Dietrich Wörner, discusses a potential far-side moon station at the the Space Foundation's 31st National Space Symposium, in April 2015. Wörner said that "the moon station can be an important stepping stone for any further exploration in deep space," adding that a lunar outpost could help humanity learn how to use resources on-site instead of transporting them. "In any case, the space community should rapidly discuss post-ISS proposals inside and with the general public, to be prepared," Wörner concluded. Wörner's appointment as the next director general of the European Space Agency (ESA) was announced on Dec. 18, 2014. He will succeed Jean-Jacques Dordain, whose term of office ends on June 30. Currently, Wörner is chairman of the executive board of DLR, the German Aerospace Center. He advocated a lunar far-side base at the 31st National Space Symposium, both in a panel of space agency leaders and during a focused panel on space in Germany. "We have to look into the future about what are the next destinations … what to do after the International Space Station," Wörner said. The end of ISS operations is very close, "and we better know what to do afterwards," he added. Mars is a "nice destination," Wörner said, but he also asserted that a far-side outpost on the moon offers a number of "drivers," including cosmological research. For instance, the lunar far side is shielded from radiation-chatter broadcasts from Earth, allowing radio telescopes built there to survey the universe with very little background noise, he said. Wörner told Space.com that the far-side outpost is not a new idea. "But now we have to do it as opposed to study it," he said. The lunar far side as seen by NASA's Lunar Reconnaissance Orbiter's Wide Angle Camera (LROC). The global space community should seek out joint activities on a scale that a single nation cannot realize, Wörner said. In the past, there were many scientifically sound proposals to further investigate the moon, he added, with special scientific possibilities championed for the lunar far side, such as in astronomy and in fundamental research. NASA chief Charles Bolden also took part in the panel of space agency leaders during the symposium. From the far side: A large Arecibo-like radio telescope on the moon's far side could make use of a crater for structural support, enabling unique sweeps of the universe at large. Bolden had recently come back from Europe, where, he said, he participated in discussions with nations now scripting a space-exploration road map. These conversations touched on many topics, including to what degree other countries wish to cooperate with NASA on its Asteroid Redirect Mission, he said. "Although Mars is the ultimate destination for humanity, we mustn't forget that there are lots of other places in the solar system. And there are places where humans will go and must go," Bolden said. "A lot of our international partners are interested in lunar exploration." NASA views the moon as an interesting destination as well, he added. "We're going to spend a 10-year period of time between 2020 to 2030 in cis-lunar space," Bolden said, "trying to establish an infrastructure in lunar orbit from which we can help entrepreneurs, international partners and the like who want to get down to the surface of the moon." NASA "can't lead it," Bolden added. "But I hope you'll let me have at least one astronaut on the mission that goes down to the surface of the moon … because there is invaluable experience to be gained from doing that." Leonard David has been reporting on the space industry for more than five decades. He is former director of research for the National Commission on Space and is co-author of Buzz Aldrin's 2013 book "Mission to Mars – My Vision for Space Exploration" published by National Geographic with a new updated paperback version to be released this May. Follow us @Spacedotcom, Facebook or Google+. Originally published on Space.com.